Most anyone who has a paver block patio or brick walkway has constant struggles with weeds. Life finds a way! Unfortunately, it’s often through your bluestone. Weeds are generally dealt with in a couple of different ways: by pulling them out, and by spraying them. Pulling weeds requires time and effort, so sprays are often a faster and easier choice for weed control. 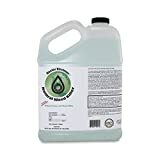 After a thorough look at several patio weed sprays, both natural and chemical, we have found that the best patio weed killer is Ortho GroundClear Concentrate. This is definitely is not the most environmentally friendly substance around, and so it may not be ideal for those with kids, pets, or who are environmentally conscious. But if you need to kill weeds, well, there you go. For a complete review of the Ortho GroundClear, see our product reviews section below. The best option for natural or organic options for a functional patio weed killer was Doctor Kirchner’s Natural Weed Killer. This weed killer overcomes the reputation that natural herbicides have of not being as effective as chemical weed removers. The solution is a mix of ocean water, vinegar, and dish soap, making it safe for the environment, children, pets, and bees. For a complete review of the Doctor Kirchner’s Weed Killer, see our Product Reviews section below. 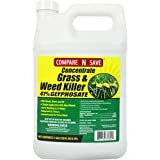 Compare-N-Save’s chemical weed killer is a 1-gallon concentrate solution of 41% glyphosate. Mixing in anywhere from 4 to 12 tablespoons per gallon of water, you can make this solution last a while. It can cover up to 25,000 square feet effectively and makes up to 85 gallons of spray. This is the best option to use if you have a lot of patio area to deal with without wanting to spend a fortune, and as the quantity goes up, the price continues to get better and better per gallon. In this section, we will look closely at five different patio weed killer sprays. We’ll consider the effectiveness, the toxicity, the quality, and the price of each of these units. GroundClear Vegetation Killer by Ortho is a fast acting weed killer that works on driveways, walkways, patios, and other areas for up to one year. Its results begin to become visible in as little as an hour. Contact the seller from whom you buy GroundClear from to obtain warranty information. Ortho’s, GroundClear Vegetation Killer has garnered a positive reputation as a weed control system. Many regard it highly both due to how fast it kills weeds and because of the long-lasting effects of the treatments. Depending on the type of weeds you spray, it may take hours or days for it to take into effect. Since this is a concentrated solution, follow the directions to mix it with water. This will ensure that you don’t overkill the weeds and only use the amount necessary to get the job done, allowing you to get more uses out of it. Consider a higher concentration if it doesn’t work the first time around. Use GroundClear if you need certainty that the weeds you spray will be gone. On the potency scale, this ranks on the higher side. For the price range, GroundClear is positioned between a budget option and a more expensive weed killer. The bottom line with this one is that if you need your weeds gone, and don’t care about the chemical makeup of the killer, the Ortho GroundClear is a great choice. 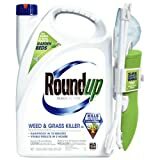 Roundup is a well-known weed killer that is sometimes seen as controversial due to the manufacturer (Monsanto) due to the heavy chemicals involved. With that said, this weed killer is successful at doing what its made to do: kill weeds. Roundup offers a full replacement of product or refund upon sending in proof of purchase. Roundup is a chemical formula weed killer that is an all-in-one solution. It comes with a ready to use pump and sprayer with its own no-mix formula. Simply use it on the desired areas such as on mulch beds, cracked driveways, and patios, and you’re good to go. The no-mix formula means that you don’t need to worry about mixing it with the right solution or amount of water in order to be successful. Results can be made visible in as little as three hours. If chemical contents are not an issue, then Roundup will get the job done, and the included sprayer means you don’t need to purchase any additional application tools. Roundup Ready’s Weed and Grass Killer III’s overall potency is considered high, much like GroundClear. As always, keep away from children and pets and exercise caution in what areas you spray it in. Compare-N-Save is a budget option for those looking for a patio weed killer. The option we looked at comes in 1-gallon units and can cover up to 25,000 square feet. Glyphosate, the main ingredient in Compare-N-Save’s Weed and Grass Killer III, was first discovered by a Monsanto scientist. The patent expired in 2000, so other companies are free to use it, as we see here. At 41%, it is heavily concentrated, and you can mix small amounts of the weed killer with gallons of water to still see good results. This stuff will last a long time. An important note is that glyphosate only kills weeds that are active and growing, but it won’t work as a pre-emergent. When mixing, two tablespoons is equal to one fluid ounce. A general rule of thumb is 5% concentrate will kill the tougher weeds, so you can start with something less than that and see how it responds first. For example, if you want to start with 2%, mix 1 gallon with around 5 tablespoons of Compare-N-Save. For a 5% mixture, you’re looking at around 13 tablespoons. Using this method, you can effectively determine how strong the weeds are and how much weed killer you can use (or save) with each use. As with some of the other weed killers on our list, this one does not include a sprayer, so you may want to pick up a tank sprayer like this one from RoundUp. Compare-N-Save is a good all around budget option that can go a long way. If the weeds prove resilient, then using much higher concentrations of it may mean that it just won’t last as long as other weed killers that are more potent. The first of two pet & kid safe herbicides we’ll look at, Doctor Kirchner is a vinegar based, bee-friendly weed killer that may be more suitable for the home environment. With a solution made of vinegar, ocean water, and a dash of dish soap, Doctor Kirchner’s Natural Weed Killer is more environmentally sound and safer than the other weed killers we’ve reviewed thus far. This is a great option for those with children or pets, as it is fast acting and doesn’t leave a dangerous trace after its done its job. There are two major benefits to using this weed killer. First, it is safe to replant as soon as it is dry. Unlike other weed killers that will leave the soil contaminated for a long period of time, this weed control system is fast acting without destroying soil that supports plant life in the first place. Secondly, due to its natural ingredients, it will last a long time. Doctor Kirchner has claimed that its shelf life will last “literally forever”, so if you only use half of it this year and need some down the road, it will still be good to use. One of the first things that come to mind regarding natural weed killers is their efficacy and how they really function when it comes to successfully doing their job. When it comes to Doctor Kirchner’s natural weed killer, it successfully ticks off all the boxes: it’s very strong, all natural, and fast acting. Since it is a ready-to-use solution, you won’t get as much use out of it as a pure concentrate option like Compare-N-Save, so it is more expensive comparatively. This is not surprising, given it is a natural product. If you’re looking for a quick and natural spot treatment for the patio or walkway, this 24 oz bottle of weed killer from EcoSmart may do the trick. EcoSMART’s Organic Weed and Grass Killer is a spray on application that comes in a smaller bottle, which is better for smaller patios or a handful of problematic weeds. With an attached spray nozzle, its great for hard to reach locations. Its all natural formula makes it safer to use with children and pets present. It’s made from plant oils such as clove oil, which gives it a natural scent without any overbearing tones. As far as functionality goes, the EcoSmart is a mixed bag, and ultimately it falls a bit short compared to the other natural weed killer from Doctor Kirchner. On the potency scale, this is definitely on the lighter side, so don’t expect to kill tough to remove weeds that have been around forever. Due to its natural and safe formula, it might just be ‘too safe’ – unable to effectively perform its job against some weeds. Natural weed killers have sometimes earned the reputation of not being as impactful as their chemical counterparts, and this is one instance where that may be true. If you have large amounts of weeds or ones that are tough to remove, it’s better to look at a stronger formula that will be more effective. This is still worth a shot if you’re in need of a natural solution, but it is second to Doctor Kirchner’s natural weed killer in terms of strength. If you have a lot of weeds that keep coming back no matter what you do, a chemical solution might be necessary. In this case, you probably want to stick with the Ortho GroundClear Concentrate. If you have small pets or children, then a safer, more natural option from Doctor Kirchner is likely your best bet. They can get the job done without contaminating the environment and soil in which they touch. Lastly, if you have a very large area that you intend on repeatedly hitting, leaning towards a budget option might be better for the long-term, Compare-N-Save will be great for that. Hitting the same weeds consistently over a period of time will prove more effective than only once, even if the concentration is lower.